The site of the continent's first Spanish colony, Cartagena retains much of its colonial flavor thanks to a World Heritage-listed old town, encircled by old walls and protected by imposing fortresses. Go for a jaunt from Cartagena to Isla Baru to see Playa Blanca about 56 minutes away. The adventure continues: explore the historical opulence of San Felipe de Barajas Castle, contemplate in the serene atmosphere at Convento La Popa de la Galera, choose your vessel at Boats4U, and pause for some serene contemplation at Sanctuary of Saint Peter Claver. For traveler tips, photos, other places to visit, and other tourist information, refer to the Cartagena travel itinerary planner. Brussels, Belgium to Cartagena is an approximately 20-hour flight. Due to the time zone difference, you'll gain 6 hours traveling from Brussels to Cartagena. Expect a bit warmer weather when traveling from Brussels in July: highs in Cartagena hover around 38°C, while lows dip to 30°C. Finish your sightseeing early on the 11th (Tue) so you can travel to San Andres Island. The coral San Andres Island boasts a rich colonial history, exotic beaches, and a laidback, tropical lifestyle. 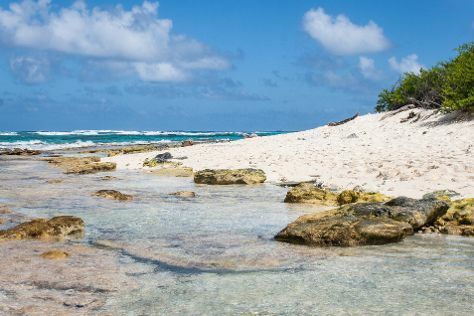 San Andres Island is known for nature, sightseeing, wildlife areas, beaches, and adventure. Your plan includes some of its best attractions: step off the mainland to explore Johnny Cay, kick back and relax at Playa de San Luis, don't miss a visit to Rocky Cay, and stroll through Bahia del Cove. To find more things to do, reviews, other places to visit, and other tourist information, you can read our San Andres Island trip itinerary builder. Traveling by flight from Cartagena to San Andres Island takes 2 hours. While traveling from Cartagena, expect little chillier days and about the same nights in San Andres Island, ranging from highs of 35°C to lows of 29°C. Wrap up your sightseeing on the 16th (Sun) to allow time to travel to Medellin. Nestled between rising hills in a narrow valley, Medellin serves as an energetic melting pot of people from all socio-economic classes. 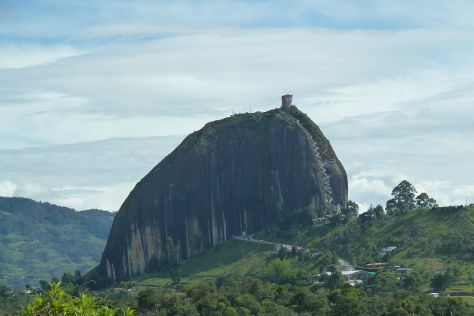 Take a break from Medellin with a short trip to Piedra del Penol in Guatape, about 1h 50 min away. The adventure continues: don't miss a visit to Plaza Botero, have fun at Parque Norte, get engrossed in the history at Museo de Antioquia, and admire nature's wide array of creatures at Parque Explora. To see traveler tips, more things to do, other places to visit, and other tourist information, read Medellin sightseeing planner. You can fly from San Andres Island to Medellin in 2.5 hours. Traveling from San Andres Island in July, expect little chillier with lows of 20°C in Medellin. Finish your sightseeing early on the 19th (Wed) to allow enough time to travel to Santa Marta. Many visitors begin their Santa Marta holiday, surrounded by urban clutter and heavy traffic, expecting little from the city in terms of historical importance. Santa Marta is known for nature, beaches, adventure, sightseeing, and museums. Your plan includes some of its best attractions: explore the wealth of natural beauty at Parque Nacional Natural Tayrona, enjoy the sand and surf at Cristal Beach, see some colorful creatures with a scuba or snorkeling tour, and tour the pleasant surroundings at Playa Blanca. 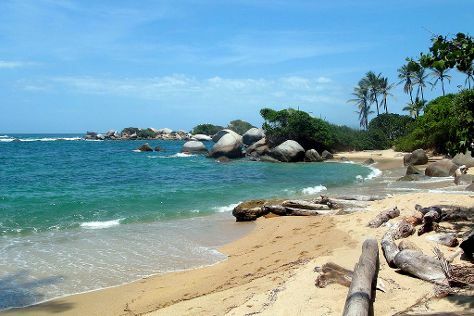 To find photos, reviews, maps, and tourist information, read Santa Marta custom trip planner. You can do a combination of taxi and flight from Medellin to Santa Marta in 2.5 hours. Alternatively, you can drive; or take a bus. Traveling from Medellin in July, expect Santa Marta to be somewhat warmer, temps between 39°C and 30°C. Finish your sightseeing early on the 23rd (Sun) to allow enough time to travel to Bogota. Colombia's heart and soul, Bogota has earned the nickname "Athens of South America" thanks to its abundance of universities, libraries, and lower-level schools. Step out of Bogota to go to Zipaquira and see Catedral de Sal, which is approximately 50 minutes away. There's lots more to do: examine the collection at Gold Museum (Museo del Oro), wander the streets of Parque 93, take your sightseeing to a higher altitude at Mount Monserrate, and explore the world behind art at Museo Botero del Banco de la Republica. To find reviews, photos, ratings, and more tourist information, use the Bogota vacation trip planner. You can fly from Santa Marta to Bogota in 2 hours. Other options are to take a bus; or drive. Traveling from Santa Marta in July, things will get much colder in Bogota: highs are around 21°C and lows about 10°C. Cap off your sightseeing on the 27th (Thu) early enough to travel back home.